Things to see.. all within a few miles of each other and you can visit them all within 6 hours total time. Falling Water - It's a house that doesn’t even appear to stand on solid ground, but instead stretches out over a 30’ waterfall. It captured everyone’s imagination when it was on the cover of Time magazine in 1938. Frank Lloyd Wright, America's most famous architect, designed the house for the Kaufmann Family and it was built in 1936-39. Kentuck Knob - Designed on a hexagonal module, Kentuck Knob is a small, one story Usonian house. Usonian, meaning affordable for the common people, was a signature design of Frank Lloyd Wright. Fort Necessity - The battle at Fort Necessity in the summer of 1754 was the opening action of the French and Indian War. This war was a clash of British, French and American Indian cultures. It ended with the removal of French power from North America. The stage was set for the American Revolution. Friday early evening drive to Oakland and preregistered dinner at Pittsburgh Golf Club. 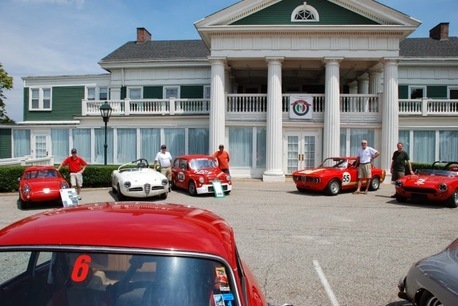 This will be the first visit by the group to the PVGP venue. Not only will the members enjoy a spectacular dinner, but also learn the exact route path to the car show for the next morning. After our opening dinner at Doubletree on Thursday night, the Pittsburgh Golf Club dinner will be an excellent group outing and break up the routine of hotel meals. We will be traveling to the Friday dinner in the opposite direction of Friday rush hour traffic which should make the trip easier. The Italian Race Drivers will be joining in for a private viewing and discussion of their race cars on the showfield. The Ferrari Club of America - Mid Atlantic chapter as well as the folks from Algar Ferrari will be joining in at this private reception. It's a great opportunity to meet the Cortile Judges who will be on hand and presenting some unique Fangio Memorabilia gifts for the Fiat Club to use as as award. Dinner reception 6 PM, dinner at 7:00. Adult meal price $26, Cash bar available. Return to hotel about 9 PM.